Talking Stone Camp is a giant's camp along the River Hjaal. The camp is usually home to one giant, while another will be nearby to the northeast herding two mammoths. 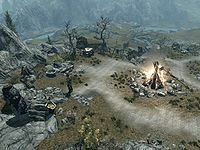 It is a typical giant camp centered around a large campfire, with a couple of fire hardened spears holding charred skeevers cooking over it. Around the camp are many painted rocks, bone chimes, strings of bones and animal bones, include mammoth rib cages. North of the campfire is an empty stone bowl with a leather strip, a random healing potion, and a random fortify skill potion beside it. To the left is another stone bowl containing many soul gem fragments and a random soul gem. Just north of this is a tree stump with a mora tapinella fungus growing on it with a chest. To the left of the chest is a large painted stone with several giant clubs, a few leather strips, a random warhammer and a shield displayed on it. On the other side of the display is a mammoth cheese bowl. South from the display are a couple of drying racks with a bunch of dried elves ear, and two bunches of dried frost mirriam hanging from them. There is a large mammoth cheese bowl between the racks. East of the drying racks and past the path to the south are another two racks. Behind them is a tree, and behind that is a high ledge where two iron ore veins can be found; they are close together and almost overlapping each other. Further east from the racks is another rack with a bunch of dried elves ear, and another mammoth cheese bowl next to that. Beyond this is a large rock formation. On a low ledge to the northeast there is a corundum ore vein. Beneath the rock is a pool of water fed by a wellspring. Submerged in front of the wellspring is a random helmet, a coin purse, and an apprentice locked chest. Talking Stone Camp has the highest number of insect spawn points, 22 in total. This means you can collect a lot of butterfly wings and blue butterfly wings during the day, and luna moth wings and torchbug thoraxes during the night. There are also a large number (23) of tundra cotton plants near the camp. A stream running from the pool leads to a waterfall above an inlet to River Hjaal. Just above the waterfall is another iron ore vein. There is the corpse of an alchemist lying on an island in the middle of the inlet. A dirt path leading west from the campfire leads to a small stream. On the other side of the stream is an iron ore vein. There is a high percentage chance of the camp being attacked by bandits. If any survive the initial attack they will flee towards Orotheim. This page was last modified on 8 April 2019, at 23:46.